We want to shed more heat than light! There has been more activity around the "Heat Balls" of late, that is, the German attempt to circumvent the EU light bulb ban law by importing and selling the incandescent bulbs as heating devices - more on the background of it below. Most of their information is in German, but those who want can use for example Google site and text translation. Recently, a large bulb shipment that had been declared illegal was released from impoundment at customs. However, they can't sell those ones, as they are still subject to the court decision against them (as described before). They are nevertheless selling some lower wattage bulbs - 60W clear type for 1.69 euro each including a 30 cent rain forest charity donation, plus postage charges. "You can (at this time) order 60W crystal only, other types are banned by the local government. The expected life time was 2000h, but realistic is about 1500h." the EU Commission have further clarified their opinion on the matter. Their basic position was made clear a year ago. It's all in German and image-copied, so no online translation. That said, as also reflected in the original court decision, one point related to the necessary labelling of the bulbs as being "unsuitable for lighting". There is a kind of trap the EU is falling into, as they themselves have pronounced the lamps as unsuitable for lighting. So the Heatball people sought clarification on this, and the EU Commission in a November 2011 letter (in German) says they are right, that the labelling would legalize the bulbs under EU legislation 244/2009 Article 3 paragraph 2. As always there is a proviso, in that the Commission suspects that in their legal quest the Heatball people will still have to show that the bulbs will not likely be "misused" as lighting, and that the Heatball company's own (current) promotion language in selling the bulbs would likely be taken into account in that regard. It was shown in the present study, that infrared radiation heating is a viable alternative to conventional heating systems. With proper use of infrared radiation heating, there are advantages in energy consumption as well as in lowered CO2 emission and overall cost. "The Higher Administrative Court in Münster will hopefully express an opinion in the near future, paving the way for the pending trial before the administrative court in Aachen." They have also started cooperative for those who want to get lamps not meeting EU standards. This is also "in the field of education on the topic of light and heat" and aims to get "more weight in the political debate" . "Heatball is a kind of art. It a satiric project against undue laws. The project shows how to do something for the rainforest quite easily." (Reuters) - A German entrepreneur is bypassing a European Union ban on light bulbs of more than 60 watts by marketing his own brand as mini heaters. Siegfried Rotthaeuser and his brother-in-law have come up with a legal way of importing and distributing 75 and 100 watt light bulbs -- by producing them in China, importing them as "small heating devices" and selling them as "heatballs." To improve energy efficiency, the EU has banned the sale of bulbs of over 60 watts -- to the annoyance of the mechanical engineer from the western city of Essen. Rotthaeuser studied EU legislation and realized that because the inefficient old bulbs produce more warmth than light -- he calculated heat makes up 95 percent of their output, and light just 5 percent -- they could be sold legally as heaters. On their website (heatball.de/), the two engineers describe the heatballs as "action art" and as "resistance against legislation which is implemented without recourse to democratic and parliamentary processes." Costing 1.69 euros each ($2.38), the heatballs are going down well -- the first batch of 4,000 sold out in three days. Rotthaeuser has pledged to donate 30 cents of every heatball sold to saving the rainforest, which the 49-year-old sees as a better way of protecting the environment than investing in energy-saving lamps, which contain toxic mercury. A German 2010 article has further background information. They were also part of the Austrian film Bulb Fiction, highlighting some of the faulty arguments and industrial politics behind the EU ban (I have been meaning to do a separate post about the film). More photos in this Austrian Film photographic archive, and video clip links etc. As the USA ban is coming up, and continuing with a comparative look at how Europeans have thought up ways around the regulations, the attempt to sell 90% heat emitting products as "heat balls" was interesting and imaginative. They have for the last months been considering an appeal in a higher court and how to go about it. Meanwhile, in September they tried to have the Heatballs sold in Switzerland (outside the EU) but in October this got a definite no from the Energy ministry official responsible for Energy Efficiency legislation. 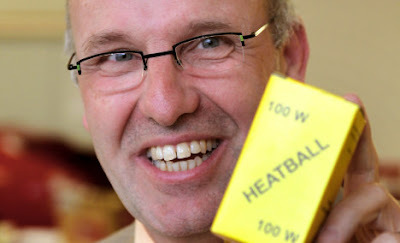 (the name "heat balls", also using English in Germany, was presumably to take away from the light "bulb" idea). More here. The case was not altogether clear however: So-called "rough service lamps" as used in mines and other such locations are also incandescent lighting as banned in the EU specifications, and there are other exemptions as for small refrigerator lamps and the like. The issue therefore turns around lighting used as GLS (general service lighting) in ordinary ceiling fittings etc. There might have been (= might be) more chance of success if the light bulbs had a specific screw-in fitting for a lamp with say a reflector in it to "beam the heat".